In Disney’s latest film, the audience is taken back in time to the days of circuses and magic acts. The 1941 animated film “Dumbo” is brought to life with the live-action remake starring a cute, blue-eyed, large-eared baby elephant and his circus family. Holt Farrier (Colin Farrell) returns from war to the Medici Brother’s circus to perform as a trick rider, but when his horses are sold, he’s put in charge of taking care of the elephants by Mr. Medici (Danny DeVito). His two children, Milly (Nico Parker) and Joe (Finley Hobbins) visit the elephant one night after Dumbo’s mother is shipped away when declared ‘mad’, and discover that it can fly. 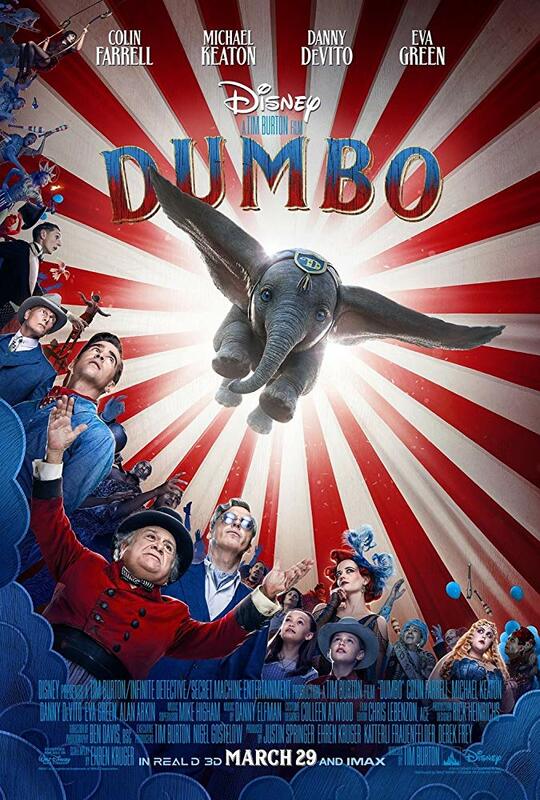 Entrepreneur V. A. Vandevere (Michael Keaton) and an aerial artist Colette Marchant take immediate notice of the circus’ sudden fame and hires the troop into their Dreamland amusement park to make Dumbo a star. Director and executive producer Tim Burton, who is known for “Edward Scissorhands,” “The Nightmare Before Christmas” and countless of other legendary films, pieced the film together, giving the classic movie his own twist. Unlike the animated film, the elephants and animals do not talk. Dumbo had to find a way to communicate other than words, through his emotions on his face, eyes and body language. Danny Elfman, who has previously worked with Tim Burton on films like “Batman,” “Beetlejuice” and others, composed the music in “Dumbo.” A well-known composer, it is a surprise to hear that he originally never wanted to create film music. Much of the movie was filmed at the Cardington Airfield Hanger in London, where V.A. Vandevere’s Dreamland comes to life. Colleen Atwood, a frequent collaborator with Burton, designed the film’s costumes and its aesthetics. “[The world] bridges between fantasy and reality. One thing that’s amazing is that so much of it is real, like the sets with the big circus parade. You realize you are in a really magical, very rare place that you might never get to be in again. You really felt like you’re in the moment. It was a really amazing experience,” Atwood said. The production designer of the film Rick Heinrichs, met Tim Burton at Disney and they became frequent collaborators, working together on “Sleepy Hollow,” “Beetlejuice,” and many others.